Speaking in Brussels, the Hungarian secretary of state for international communication and relations, Zoltán Kovács, called the Parliament’s debate due on Wednesday “a campaign rally done according to Soros planning”, referring to George Soros, a US billionaire of Hungarian origin. Hungary's gov will not take part in this week's EP debate on rule of law. Spokesman Zoltán Kovács describes it as a political rally, mentioning George Soros five times in the first two minutes of his explanation (I lost count after that). Kovács, in fact, repeated what his boss, Prime Minister Viktor Orbán, was quoted as saying on Friday on the website “About Hungary”, run by the Hungarian government. Orbán said the European Parliament’s debate on the rule of law in Hungary will be a “George Soros-type séance, an election rally, a campaign event”. The Hungarian prime minister then took aim at Timmermans, who is also the Spitzenkandidat of the Party of European Socialists (PES) for the May European elections. He called Timmermans “Soros’s man” and added: “Soros is now open about wanting to take over European institutions”. Timmermans is also the politician who has been mostly in favour of triggering the Article 7 procedure against Hungary for a systemic threat to the rule of law. “We see an effort of Soros-related NGOs and organisations to take over European institutions, we mean it. That is, the content of decisions, the content of debate, the design of different elements of policy are being run by Soros-affiliated organisations”. “And it’s very unfortunate that we see one focal figure in that emerging, not only in the past weeks but in the past couple of years, and it’s increasingly penetrating and disturbing, and that’ the role of Mr Timmermans, as vice president, as an arm of these leftist-liberal Soros-related organisations”. He insisted that “European institutions should not be used for political purposes in that way, especially now that Mr Timmermans is a Spitzenkandidat”. “It’s not possible for a person who is running for a European Parliament seat to be an active member of the Commission, to play an active role in the Commission,” he said, giving as an example “another vice president, running for president in his country” [Slovakia’s Maroš Šefčovič], who was temporarily suspended from his position. “It’s a huge question how is it possible that rules were bent” to the profit of Timmermans, Kovács said. “One of the chief representatives of the pro-migration stance in the EU, that’s the focal point here, as a Spitzenkandidat is running a campaign, which is basically mixed with his role in the Commission. That’s not good”, Kovács stressed. “What we see and hear preaching about, the rule of law, the rules are always bending according to the wish, will, political content and desires of these political figures. It’s a huge question why that is happening, how is that possible, and also, we should look who is financing it, who is providing logistic and other support for this political campaign,” the Hungarian official said. He added that this was the reason why Hungary would not participate in the debate in Parliament. “It’s a campaign rally, organised by Mr Timmermans and the likes, by Ms Sargentini [the Green rapporteur on Hungary, Judith Sarentini], this is the political left and liberals, and I’m not going to mention the Soros family and the Soros-financed organisations. We are not going to let it happen that European institutions are being used for campaign purposes”, he said. Kovács also appeared to directly criticise Commission President Jean-Claude Juncker. “The existing Commission announced itself as a political Commission. That’s not good. It was not designed for this, it was not meant to be a political body, it should be the least political of the three main European institutions,” Kovács said. 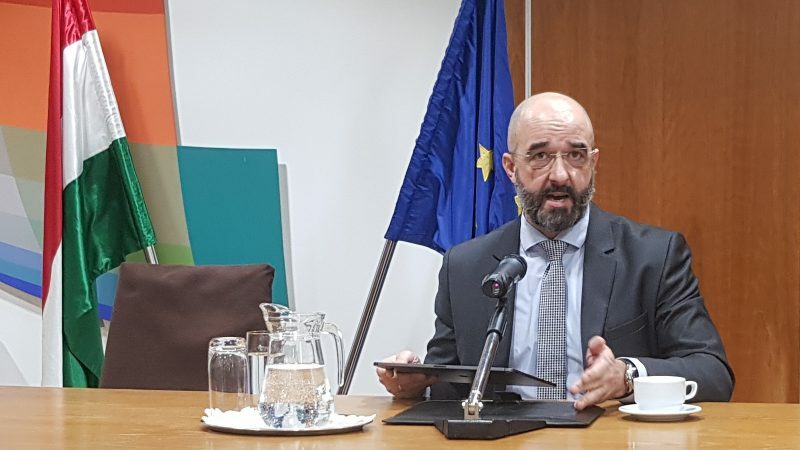 Asked if Hungary’s ruling Fidesz party would join the so-called Kazcynski-Salvini axis, Kovács said that its position is to stand strong with the European Peoples’ Party (EPP). 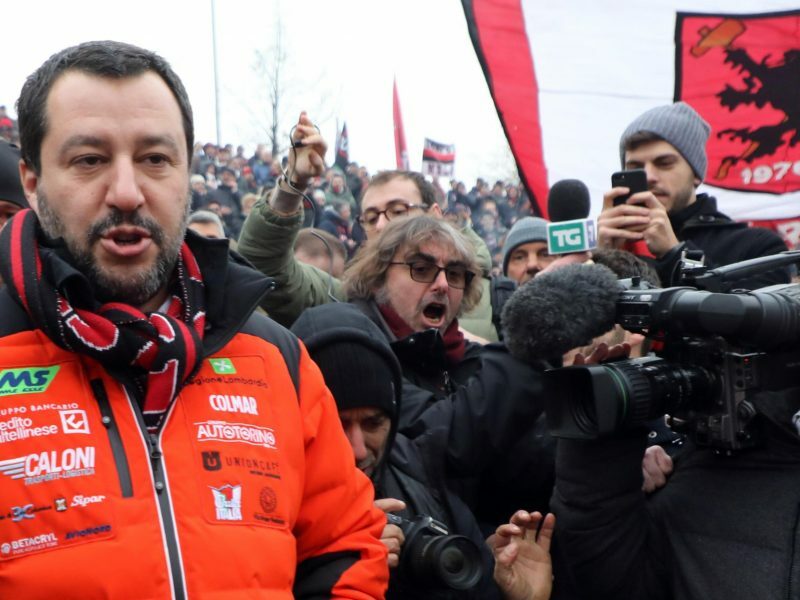 Matteo Salvini, Italian deputy prime minister and leader of the far-right Lega Party, was recently in Poland to discuss with the leader of Poland’s ruling party, Jarosław Kaczynski, the possibility of forming a eurosceptic alliance to contest the European Parliament elections. Italy’s far-right Deputy Prime Minister Matteo Salvini and the leader of Poland’s ruling party, Jarosław Kaczynski, will discuss on Wednesday (9 January) the possibility of forming a eurosceptic alliance to contest the European Parliament elections in May. “We belong there, we are members, and our election campaign and the content of it are going to be in line with the EPP campaign”, he said. The Hungarian official, however, admitted that part of EPP had become liberal, and said this was wrong. “A Christian-Democrat is not a liberal. There are clear dividing lines between these political ideas. Even a socialist is not supposed to be a liberal, but I won’t elaborate on that,“ he said. “Instead of leaving, we will stay and we will try to bring back the rules to where they belong,” he concluded.